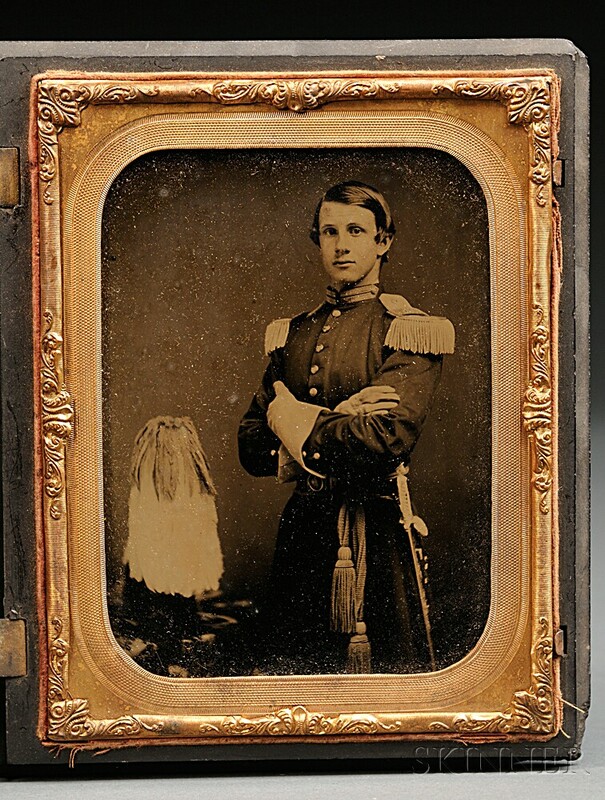 Cased Militia Officer's Half Plate Ambrotype, c. 1850s, standing image with a plumed shako sitting on a table, soldier with his arms crossed in a frock coat with epaulets, sash, sword, and sword belt, inside of the thermoplastic union case marked GENUINE UNION CASE,/IMPROVED./S. PECKS PATENT/OCT. 3D. 1854/H. HALVERSON'S PATENT/Aug. 7th, 1855./Assigned to S. Peck./S. PECK'S PATENT,/Feb. 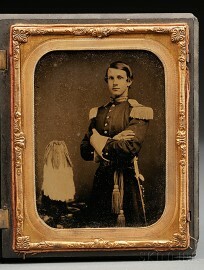 5th, 1856., overall ht. 6 3/8, wd. 5 1/4 in. Some chips missing from the case, image is in very good condition.